Research has shown that when dogs make more eye contact, it increases their chances at getting adopted. 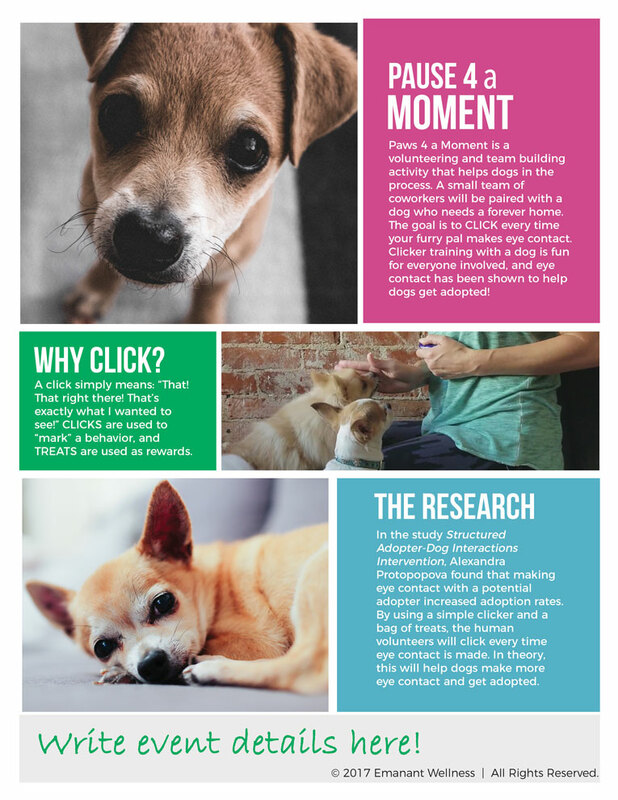 Now you can help dogs make a positive association with eye contact while working on your “social wellness” (helping others) and team building in the workplace (or wherever, who cares). Use the code better to get this workshop kit ENTIRELY FREE. You will get info on how to run the workshop, a PowerPoint deck, marketing materials (like flyers and 2 MP4 videos), and you can even watch a video which shows the presentation being delivered. Check out Paws 4 a Moment on EmanantWellness.com. So head to Paws 4 a Moment on EmanantWellness.com and use the code better when you check out!